Corporate executives and women in leadership aspire to see more women in the executive positions of their companies (including themselves). In many organizations, women are not advancing. The good news is that women are in the position to empower themselves to advance as leaders. 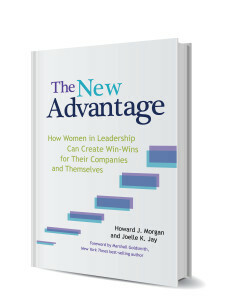 The New Advantage reveals strategies for what works in improving business results by advancing women as leaders. Howard Morgan is a Co-Founder and Managing Director of the Leadership Research Institute. LRI is a global consulting firm specializing in leadership and organizational development. Dr. Joelle Jay is a principal with the Leadership Research Institute, as well as an executive coach, keynote speaker, and the author of The Inner Edge: The Ten Practices of Personal Leadership. Elizabeth Keller was the Senior Vice President in a global role at a leading software company and the highest-ranking woman in the company. Despite years of glowing reviews, accelerated promotions and positive reinforcement, she felt she had gone as far as she could go at her company. Her next promotion would put her on the Executive Committee in a C-level role, but that promotion never came.